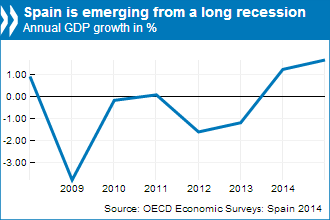 Spain is emerging from a protracted recession, marked by a return to moderate growth and rising international competitiveness. Decisive banking and fiscal reforms, coupled with supportive monetary policy from the European Central Bank, have reduced financial tensions and improved public finance. But to ensure that the recovery is sustained and unemployment returns to much lower levels, full implementation of on-going structural reforms and further measures to improve productivity and competitiveness are now needed, according to the latest OECD Economic Survey of Spain. However, there is still room for improvement. Spain can build on these reforms by cutting employer social contributions for low-skilled workers, which would boost both job creation and international competitiveness. Similarly, rules covering entrepreneurship and investment – key components of the knowledge economy – need to be revamped, to reduce barriers that prevent firms from starting, entering markets and growing. Efforts to remove barriers to competition are also needed in the professional services sector and in some market sectors, such as electricity (OECD).